ADS member Reaction Engines today successfully tested the first phase of its high-temperature testing of its Sabre air-breathing rocket engine. The Sabre rocket engine is designed to drive reusable space planes to orbit and take airliners around the world in just a few hours. Today’s test was to see how Reaction Engine’s revolutionary precooler heat exchanger would work under high-temperature testing which is designed to directly replicate supersonic flight conditions. In the test, the air was heated to 420°C to mimic the thermal conditions which would take place at Mach 3.3 in flight. This speed would match the record of the fastest ever jet-engine powered aircraft, the SR-71 Blackbird and is over 50% faster than the cruising speed of the Concorde. The Sabre can be thought of like a cross between a jet engine and a rocket engine. At slow speeds and at low altitude, it would act as a jet, burning its fuel in a stream of air scooped from the atmosphere. However, at high speeds and at high altitude, it would then transition to full rocket mode, combining the fuel with a small supply of oxygen the vehicle had carried aloft. The ultimate aim for Reaction Engines with the Sabre engine is to produce a reusable aircraft engine that would combine the fuel efficiency of a jet engine with the power and speed of a rocket. Reaction envisages an aircraft with a Sabre engine could travel the distance between New York and London in less than an hour. 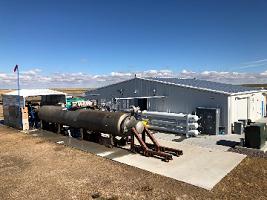 This test was performed in Reaction’s testing facility in Colorado however the company plans to build a new test facility in Westcott in Buckinghamshire in the near future. Over the past few years, the company has secured investment from a number of companies such as Rolls-Royce, BAE Systems and Boeing HorizonX. This is just one example of how UK expertise in space is leading the way into the future of flight and space travel. The UK space sector is not only growing but revolutionising the way things are done and it’s great to see so much promise for the future of the industry right here in the UK.